Finding the right internship for your SIWES program requires some research and planning but the results are definitely worth the effort. Seeking out this temporary job opportunity can best be accomplished by using several different strategies. Study shows that nearly 30% of graduates from the previous year are still unemployed. Students with internship experience get on average 20% higher starting salaries to those without! Internships are not just for junior year summer, they are the #1 gateway to jobs! If you are not quite sure what you want to do in regards to a long-term career, internships can give you exposure to opportunities to a wide array of fields and give you a chance to “test the waters” of new and exciting job opportunities. To find the right internship It is important for you to know what you want to do. Gaining experience in a number of career fields is especially a good idea if you have no idea what job you are interested in pursuing after school. Run your job search like an entrepreneurial business using basic marketing strategies. 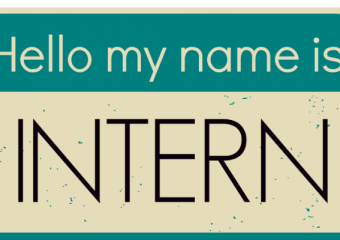 Just because you are interested in marketing does not mean you need to or should go intern at a big marketing firm. Consider startups, NFPs, and more! Ability to get hands on experience and make an impact! Shorter hours, easy to schedule and often much less competitive. Skill based volunteering in particular is a great path to get experience! Smaller companies are more willing to take risks on less experienced employees. At startups you can impact the bottom line and develop a portfolio of real work. 99.7% of businesses have under 500 employees. Firms under 20 employees make up 18% of all jobs. Often less competitive for hiring and great for getting hands-on experience. If you started your own business, even if it was a small one where you sold ice cream; mention it and tell what you learned and how it helped you develop. 9. Prioritize internships and the job search. Think of it like an extra class. Create your perfect CV – Fast & easy! 12: Put professional experience on top of your resume–employers need someone who can hit the ground running. 13: Want to be a Marketer? 14: Want to be a programmer? Post completed projects on Github. 15: Want to do PR? 16: Want to do accounting? 17: Want to be in management? Run a club or Greek House! 18: Want to be a journalist? Write for the University Daily! Compliment the company you are applying to, everyone likes flattery. Mention something specific about the company, something you like, some idea you have that is relevant to them, some press they got, etc. 21: Build your personal brand. 22: Should I design my resume? Not unless you’re an art/design student. Maybe put the company you are apply to’s logo on it. Create your perfect CV – Fast & easy! 24: Make a personal blog. 25: Make personalized letter head. 26: Make personalized thank-you cards. 27: Always follow-up after networking AND after interviews. Be sure to follow-up with employers when possible to arrange an in-person or telephone interview. Telephone or visit employers in your geographic and/or job areas of interest and ask about holiday jobs/internships. Thanks for taking the time to speak with me yesterday. I really enjoy how your company focuses on generating deep online relationships, this is something I have found important in my own writing for the Daily blog and why I always follow-up with guest bloggers when they write for me. 29: Put class projects online and link to them in your resume, business cards, and more. 30: Go to events (Chamber of Commerce, Local Associations, alumni mixers, etc.). Top employers attend career fairs to recruit, screen, and hire talented interns and employees. Be ready to give a 60 second introduction that describes your skills, interests, experience, and motivation to the employer. 31: Use MeetUp.com and other professional services to learn more about your industry and meet connectors. 32: Talk to Lecturers, family and friends. Speak with family, friends, faculty, school advisors, and career counselors about what type of internship you want and when and where you want to do it. Contacting alumni from your school and doing informational interviews can give you valuable information on career options you can pursue as an intern. Be sure to send a thank you note expressing your appreciation to them for sharing their time and expertise. There are many great online resources that can help you find out what is available out there on the job market. 33: No one hires on the first date – build relationships. Ask about how they got to where they are now, ask for industry feedback, ask for tips on how to break into your industry of choice. Ask the person you just networked with if they know anyone else you should speak with? 36: Remember AFU (Always Follow-Up!). 38: Get your LinkedIn friends to intro you to their LinkedIn friends. Watch this video from JobJenny.com. Simple yet highly effective tips. Share the video with your friends to help others, please. That’s what Linkedin is all about. 39: Get rid of any suspect photos on Facebook or make them private. 40: Make Your Facebook picture the same as your LinkedIn picture, the same as your business card picture (personal branding). 41: Find a way to make the process interesting for the person you are networking with. Can you help them? Can you give them insights into what college students are doing or what colleges are teaching? 44: Research and target organizations that match your interests and skills. Identify specific hiring decision-makers to approach. 45: Develop a compelling communication and presentation plan to position you as a highly attractive job candidate. 46. Utilize various alternative methods to arrange non-interview meetings with targeted decision-makers. 47. Practice and perfect assertive face-to-face communication techniques. Do not limit presentations to traditional interviews. Prepare job creation strategies. If you need help selling your skill, attend mock interviews to increase your skill, or even find one of the many books that teach you how to sell yourself to potential employers. 48. Master powerful closing and negotiating techniques. 49. Repeat the process to acquire multiple job offers so you can select your next job rather than settle for it. 50:Stay optimistic and have fun! While using the above methods to conduct your search for internship, be aware that certain industries and job opportunities have early deadlines. Most companies recruit I.T students as early as March. Therefore, begin your internship search 4 – 6 months to affords you more time to look for internships before commencing date. In other words, you need a carefully-crafted plan that will consistently move you toward success in looking for an intern job . . . a track to run on that gets real results. When you do that you can dramatically move the odds in your favor of a quick and lucrative job search. You can check with us for help and to find out which internships recruit early. If you are unsure of what kind of company you want to work for, pick a location and just start applying to anything that sound interesting. Visit job search sites so you can get more detailed search results. Last but not least, you can also check out the classified ads in your local newspaper to find employers who may be interested in hiring an intern. Register on forums to benefit from job and/or internship discussions and posting you may be interested in. Focus on holiday jobs available and, if interested, consider taking online courses to gain additional interpersonal and communication skills. If you have any special skills, make sure you draw attention to it and tell how it will help you perform well as an intern. Many students do not bother to tell recruiters that they speak another language; a quality that makes them very valuable to a business. New graduates and career changers can also do internships to gain perspective on new job fields and develop new knowledge and skills. These opportunities can be the bridge between an unsatisfying career and a potentially new and exciting venture. If you have any question or contribution about finding the right internship, please share your thought in the comment below.